IDW’s Doctor Who “Prisoners of Time” is the 12-part multi-Doctor crossover book that does it’s best to celebrate the 50th anniversary of Doctor Who. I was immediately drawn to the book because of the premise. I was however let down a little bit by the format. I assumed that the 12 issues would all be part of one long story with different incarnations of the Doctor overlapping each other. One of my favorite bits from the TV program is seeing Patrick Throughton (Doctor 2) argue with Jon Pertwee (Doctor 3). The first issue (sporting a fantastic cover by artist Francesco Francavilla) runs a little slow and feels a little wooden. It took me a while to get into it. I thought I’ll give the second issue a chance and see how it does. It was a much better installment. It occurred to me that each issue was going to do it’s best to mimic the tone and type of stories that would be associated with each Doctor. By the third issue I could hear the actors voices in my head. I was very pleased with the series and was enthusiastic about collecting the whole set. However the series started to bog down when the pattern became very clear as to what was happening. 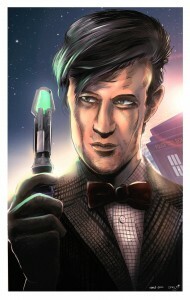 Each issue would begin with the Doctor and his companions on a new adventure. Something during the issue (usually at the end) a mysterious hooded villain would suddenly pop up and abduct the Doctor’s companions. This would happen like clockwork with little to no variation. Instead of each issue feeling like it was building to something great, it felt like I was getting 11 different flavors of Doctor Who rather essential ingredients to one satisfying meal. I had an issue with some of the artwork as well. Not that any of it was terrible (issue 6 did have some weak moments) it just changed artists from one issue to the next. This added to the feeling of isolation for every issue. Once the identity of the villain was established the series seemed to wrap up rather quickly. I think perhaps if the Doctor knew who he was early on (and if the issues were presented out of chronological order) the Doctor would not look so clueless towards the end. We could have followed one incarnation of the Doctor as he tried to piece together what was happening to his companions as he met his younger self. I think following one character would have added a little more emotional ressonance to the book. Overall it’s worth checking out but don’t expect any essential reading to come out of the series.